This is a fun idea for a book (which I received as a review copy). It gives a vegan take on all of the winter holidays – from Thanksgiving through New Year’s Day. I was impressed with its inclusiveness – with Kwanzaa, Hanukkah, and Christmas all included. My family indulged me this Thanksgiving as I tested out recipes from the Thanksgiving section for our feast. I had a hard time narrowing my selection down to the four recipes that I chose as there are many delicious sounding recipes. I was amazed at how seasonal all of the recipes were as all of the Thanksgiving recipes used the produce I had on hand from my CSA – butternut squash, potatoes, onions, garlic, peppers, carrots. I was surprised that I couldn’t find a green bean recipe as that is a crucial element to our Thanksgiving feast, but otherwise I was pleased with the selection. I was most impressed with the sweet recipes. The chocolate mousse was amazing and quite simple, and so good that my three year old required a bath after eating it. The cranberry sauce was equally amazing. I found my three year old plucking the cranberries from the sauce before the meal was served, and she told me it was yummy. When reviewing this book, my first test was to check for a recipe for Hoppin’ John. As a southerner, I think no New Year’s celebration is complete without this black-eyed peas recipe. I was happy to see this recipe was included, interestingly in the Kwanzaa section, along with recipes for corn bread and greens. I’ve been perfecting my southern New Year’s Day dinner for years, and I’ll be happy to try out some new recipes. All in all, I found the recipes fairly easy and many were tasty. They were not all hits in my home, though many were. 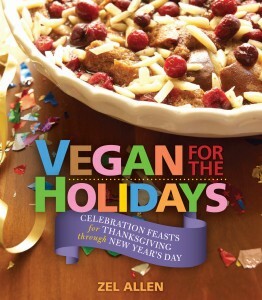 I look forward to enjoying this book for future holidays, and getting inspiration for ways to expand my holiday menus. I recently saw this book for sale at Roots Market in Maryland. Glad to know it’s full of tasty, easy recipes – I will check it out! I think requiring a bath is as good an endorsement as I’ve ever read for a recipe! Not to be negative but I’m curious about the recipes you weren’t thrilled with – did they not turn out at all or was it more of a preference thing? Thanks! Homa, I’m not sure if I did something wrong, but the gravy for the mashed potatoes did not turn out. It seemed like I must have missed an ingredient or used too much water, or it was a bad recipe, but we didn’t end up have gravy with our meal. I enjoyed the butternut squash dish, but my wife thought it was bland. That’s a common complaint she has with butternut squash, which I don’t understand. But we liked the mashed potatoes, the chocolate mousse with cranberry topping, and the cranberry-pear sauce. Interesting regarding the gravy, I usually manage with veggie broth, onion, oil, spices, and potato flour so I’m surprised it called for water! I am a butternut squash fan, too, but I don’t have a big variety of ways to prepare it. My favorite, though, is a gratin in Deborah Madison’s Vegetarian Cooking for Everyone. It calls for cubed butternut squash tossed with a bit of flour + fresh parsley and drizzles of olive oil baked for over an hour. It is so simple but delicious with a side of quinoa and a little earth balance. Thanks for the extra feedback about the book!